Percona announces the release of Percona Toolkit 3.0.10 on May 22, 2018. Percona Toolkit is a collection of advanced open source command-line tools, developed and used by the Percona technical staff, that are engineered to perform a variety of MySQL®, MongoDB® and system tasks that are too difficult or complex to perform manually. 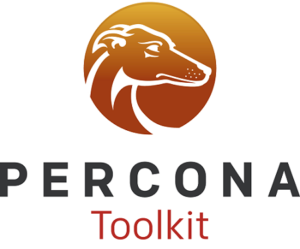 With over 1,000,000 downloads, Percona Toolkit supports Percona Server for MySQL, MySQL®, MariaDB®, Percona Server for MongoDB and MongoDB. Percona Toolkit, like all Percona software, is free and open source. You can download packages from the website or install from official repositories. The Query Response Time Plugin provides a tool for analyzing information by counting and displaying the number of queries according to the length of time they took to execute. This feature enables a new flag --disable-qrt-plugin that leverages Percona Server for MySQL’s new ability to disable QRT plugin at the session level. The advantage to enabling this Toolkit feature is that the QRT metrics are not impacted by the work that pt-table-checksum performs. This means that QRT metrics report only the work your Application is generating on MySQL, and not clouded by the activities of pt-table-checksum. We’re adding support for pt-table-checksum to identify the number of row differences between master and slave. Previously you were able to see only the count of chunks that differed between hosts. This is helpful for situations where you believe you can tolerate some measure of row count drift between hosts, but want to be precise in understanding what that row count difference actually is. Users reported that listing encrypted table status can be very slow. We’ve enabled this functionality via --list-encrypted-tables and set it to default of disabled. We’ve improved pt-mysql-summary to now include information about encrypted tablespaces. This information is available by using --list-encrypted-tables . PT-1556: pt-table-checksum 3.0.9 does not change binlog_format to statement any more.